Political Courier Media: Where to Next? I'm no longer the "18 year old high-school student/political blogger." 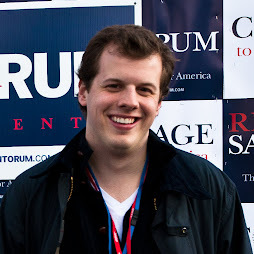 As of this morning I'm the "19 year old college-age political blogger." Despite having put another year behind me some things don't change. First, I'm still fascinated by watching and covering American elections. Second, I still love to write, take photographs, design graphics, and shoot video. In the late winter of '07 I set out to attend a few campaign events and type up summaries online. By Election Day I had been on the floor of the RNC, shaken hands with the two party nominees, been on television as a political analyst and a game show contestant, and had my blog posts syndicated around on various news sites. So what do I have up my sleeve now and what am I aiming for looking ahead to the 2012 election? It's a secret for now, but you'll find out soon!